“Flow” is a big thing at Camp. There is only one way for our waiters to flow around the kitchen to pick-up food or drop off dishes. When we remove the tables and benches from the Dining Hall there is only one door that we use; and whether we’re clearing it out or putting it all back in determines which way we will flow. When we all are in the flow then things are running smoothly, all systems are “go” and life is good. This week we work towards flow in a more pseudo-psychological way. When things are flowing then that means campers no longer have to ask where to put the wash buckets, which way they should go to Riflery or what we do during rest hour. When we all know where we’re going and what we’re doing, then life is good. I’m happy to report we’ve found the flow. Camp is bustling. Our activities are in full-go mode. Cabins 15, 17 and 18 are out on their three-day canoe trips, and our two Isle Royale trips and Pictured Rocks trips are already on the trails. 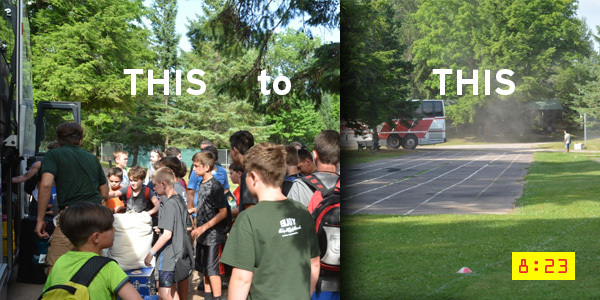 We’ve played Capture the Flag, had our first Division Day and the ladies from Red Pine Camp came over for a social. We know each others names, have figured out who goes where and with what and we know what all those bugle calls mean. I love it when we hit the flow. It means the odds of homesickness have dropped dramatically. It means our staff and full termers have gotten over the “newness” of second term and are feelin’ good. And it means we can all get out and do what we’re here to do; which is make the most of our Highlands days. It certainly doesn’t hurt that it’s 78 degrees and there’s a sweet wind blowing! So on that note, I guess I’ll get my own flow on and get outside! It’s a beautiful day at Highlands! Ps. Check out the new pic’s on our gallery and catch a glimpse of your favorite camper in the flow! I had an interesting realization the other day. I was sitting with THREE of my former counselors at supper. And there were only 4 of us at the table. Someone recently remarked to me that they thought it might be odd that we have SO many CHOF’s on staff. To me, it would be odd NOT to have them here. I’m a big fan of depth; whether it is on my staff here at Highlands, or really in any worthwhile organization. At a camp, having guys who are 19 years old is important. They can be your high energy, every minute is an opportunity to do something zany, let’s go ahead and play dodgeball for two hours kind of guys. And their energy and enthusiasm drives camp—keeps it action packed and adventurous. And we need that- and we love that. But it is also important to me to balance that with our seasoned veterans- our 24 year old guys who are swinging through Highlands during their grad school years, or as a last gasp before they head into the corporate world. These guys can still bring the enthusiasm, but they’re also the guys who are willing to step up to leadership opportunities; whether it is leading our big trips or teaching fellow staff members about trip safety and cabin bonding. They are gold. 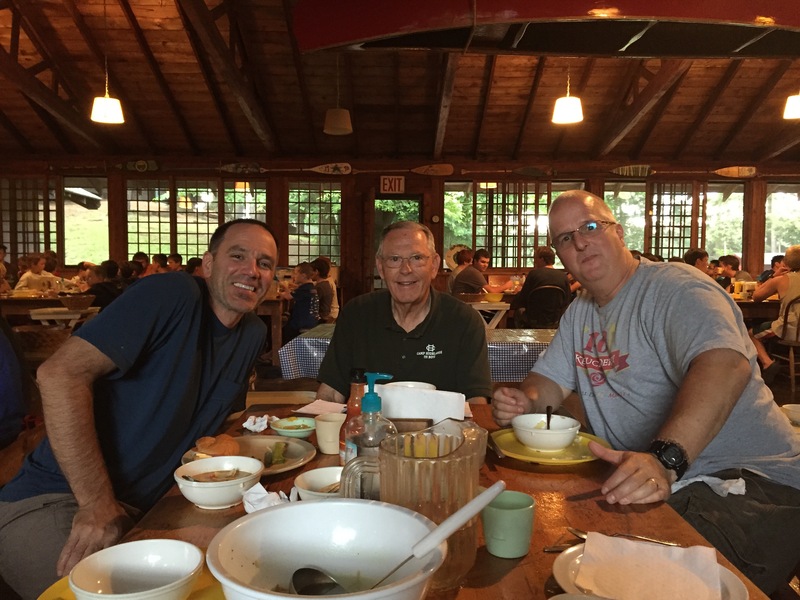 And then I have our CHOF’s (Camp Highlands Old…Fellas). The CHOF’s are those of us (yes, us…) who range in age from 27-77. Dave runs the trip room. Otter helps there, and pretty much anywhere else he’s needed. When not at Highlands, Loren is a teacher in Kansas; here he teaches canoeing. Kent is a retired teacher and cross-country coach. Here he leads our low-ropes course, and is the head counselor of our youngest guys. I have 14 guys over the age of 40 on staff. The value of having this 60 year swing in staff age is that I have a grounded, well-rounded group of guys who can bring their passion for all things Highlands, and provide the kind of coverage and decision making skills necessary to ensure that our campers have an incredible experience here. Their history at Highlands (heck, I have a few 19 year old guys who already have 10 years at Highlands!) means our values and the qualities we hold dear run deep. Both (2!) of our new staff men caught on pretty quick to the Highlands Way. My hope is your campers catch the spirit as well. I believe that having the old guys around is just as important as having the young. And I consider myself quite lucky to have the opportunity to bring them all back, year after year after year. To me, this is just one of the reasons why we have thrived for so long at Camp Highlands. And, to me, it is so cool to have my first counselor here, my last counselor here, and not one but TWO of the guys in the middle. We were anticipating rain and not a drop has fallen. The bus has arrived and campers have been settled. I once again feel the excitement in the air; but now the voices that echo out, “Ga-Ga-Ball!” are different than the ones I heard just two days ago. Second Term has officially begun, and I am already so excited for this new batch of campers to be here. The next 17 hours will have us memorizing names, listening to rules, learning about water safety, gun safety and archery safety; as well as learn how to be waiter and request an activity. Then swim tests, and BOOM! Right into the flow of camp. Exciting times are in store for us this summer. Our staff is outstanding – one of the best I can remember (and no, I don’t say that every year…) and they are all pumped for Second Term. So the stage is set- the players have arrived, and it’s time to raise the curtain on Act 2 of our 112th season. If it’s anything like Act 1 we are all in for a treat. Boys race off the bus, everyone grabs gear and the field is cleared in 8:23 flat! 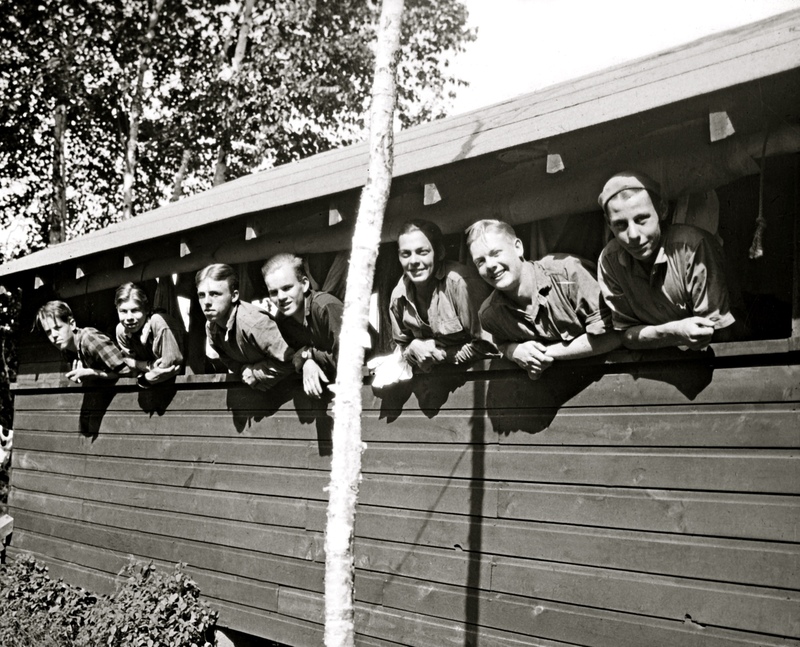 Byron Shinn spent 49 summers at Camp Highlands for Boys. Recruited as a young man by the man who was the director of Highlands before Mike Bachmann (William J. “Doc” Monilaw), Byron was one of the unique figures who could speak to the history of Highlands dating back to a time before those of us familiar with Highlands could even comprehend. Other than Mike and Sharon Bachmann, no one has spent more seasons at Highlands than Byron Shinn. He was an integral part of camp life. 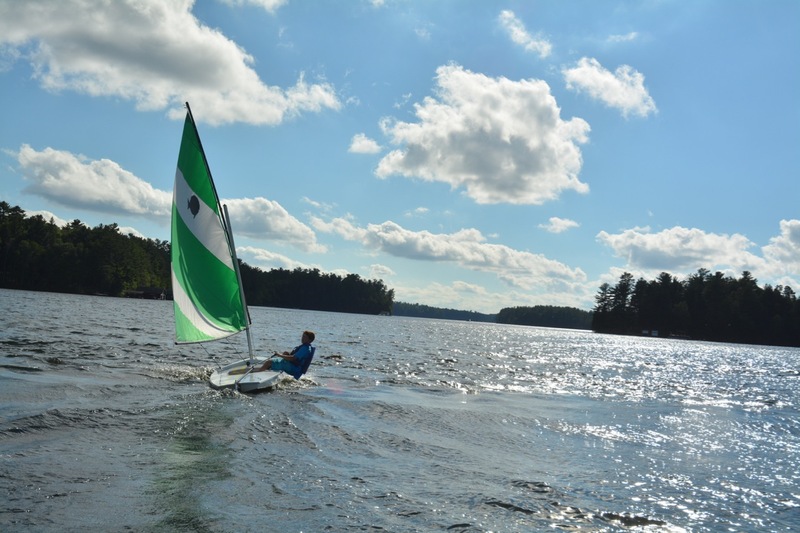 He will be most remembered for his love and dedication of the sailing program. You could often hear Byron’s booming bass shouting cryptic sailing lingo out across the lake, telling boys to “Ease the main sheet!,” “Don’t pump the tiller!” or “lift up your daggerboard!” He was a stickler for proper terminology; and many befuddled boys quickly learned the importance of knowing what was what. Byron took special pride and pleasure in leading the sailing trips at Highlands. He would skipper a 32’ foot sailboat on Lake Superior with 4 or 5 boys on board; and by the end of their journey each of them would know the pride and joy of taking the helm while under sail. He was well known for his cooking skills on those trips, and boys would often return to camp regaling their cabin mates with tales of Byron’s hearty breakfasts and delicious steaks. Though never a camper at Highlands, he did climb the ranks of the staffing positions; as counselor, trip leader, and eventually one of our head counselors. 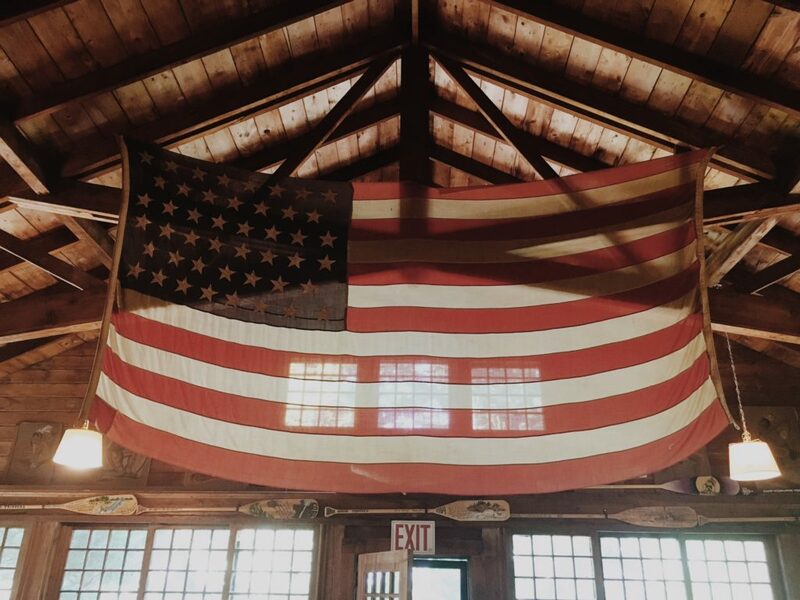 He took great pride in the fact that he was one of the trip leaders of Mike Bachmann’s first canoe trip, and was the man who taught Mike’s grandchildren to sail. In his later years at Highlands, Byron played an intregal role in probably the most important place in all of camp; the kitchen. 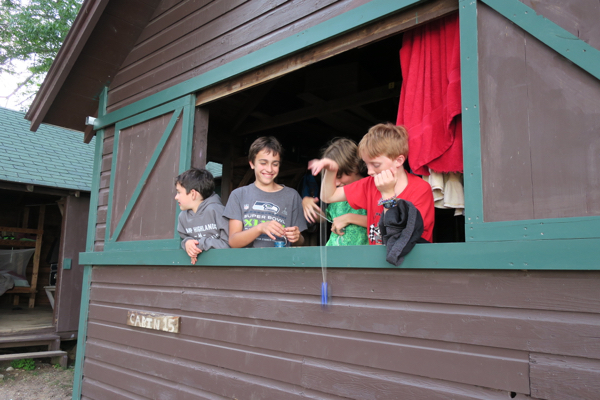 At Highlands, the boys are tasked with serving as the waiters for their cabin mates; and as you can imagine, not all 9 year olds are up to the task of properly setting the table, serving the food, or cleaning up efficiently afterwards. Byron masterfully made clueless young campers feel at ease with the proper protocols. He would arrive early before every meal, entertaining the campers with tales of why the knife blade always faces the plate (a ritual enacted by the knights of the middle ages, he claimed) as well as remind us all of the most important tool on the table, the ever present spatula! His service and dedication will forever be remembered. Already a member of our Camp Highlands Hall of Fame, Byron Shinn will live on in our hearts as a most worthwhile and true Highlands man. He will be missed. There will be a service of remembrance at 2 pm on Saturday, June 13th at the First Congregational Church of Western Springs. 1106 Chestnut, Western Springs Illinois.